Submitted by mahoney on Wed, 07/30/2008 - 11:35am. 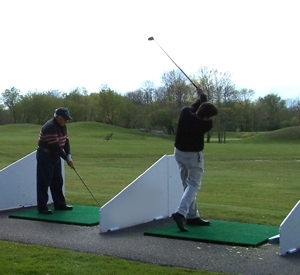 Golf Driving Ranges USA Including Alaska And Hawaii...A driving range is an area where golfers can practice their swing. It can also be a recreational activity itself for amateur golfers or when enough time for a full game is not available. Many golf courses have a driving range attached and they are also found as stand alone facilities, especially in urban areas. They are typically run by businesses or sometimes by universities. Distances are usually marked by target greens at regular distances. Golfers pay for large bucket of balls (30-200 balls) and hit at their leisure. Often there are golf professionals available to give lessons and instruction. Balls are retrieved by a specialty cart with a brush and roller attachment that automatically picks up balls and a cage that protects the driver from incoming balls. In urban and suburban areas, large nets protect surrounding people and structures from errant balls. NOTE: If your favorite DRIVING RANGE is not included in this file please email me and I will be more then happy to add it. Thanks! 08/04/2008 Deleted 1 Kennesaw-GA location due to closing. Thanks goes to "Mahoney"